Zombies are big deal these days. Seems like you can hardly turn on the TV these days without seeing someone (or someTHING) coming back from the dead. Turns out Christmas trees are no exception. Every so often during the Holidays I will get a call or an e-mail that starts off, “My Christmas tree is starting to GROW!” And indeed they are. 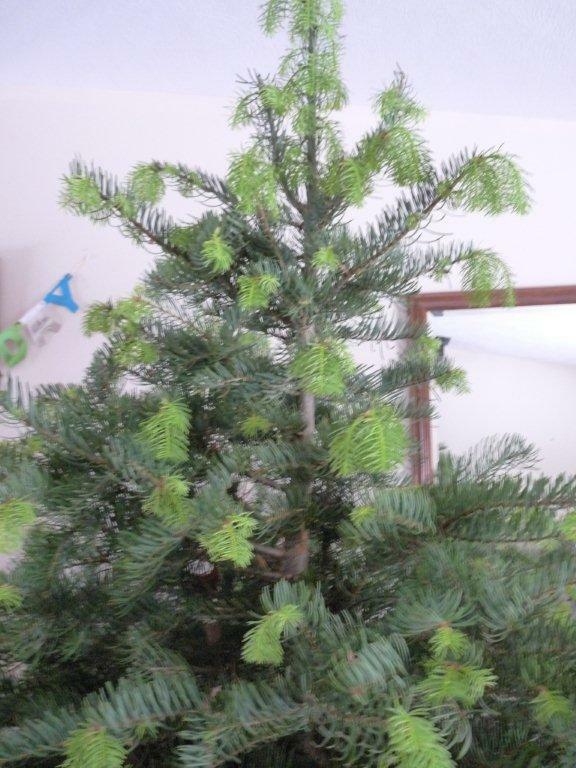 Under certain circumstances, conifers that are cut and brought indoors can break bud and begin to grow; sometimes putting on considerable new growth. So what gives? Like the proverbial chicken running around with its head cut off, Christmas trees are dead they just don’t know it yet. After they are cut, conifers can continue physiological functions – photosynthesis, transpiration, respiration – for weeks. In some cases they can break bud and begin to grow like it’s springtime when a homeowner brings them indoors. There are a couple of key factors that come into play. First, the tree must be exposed to enough cold weather to meet its chilling requirement. 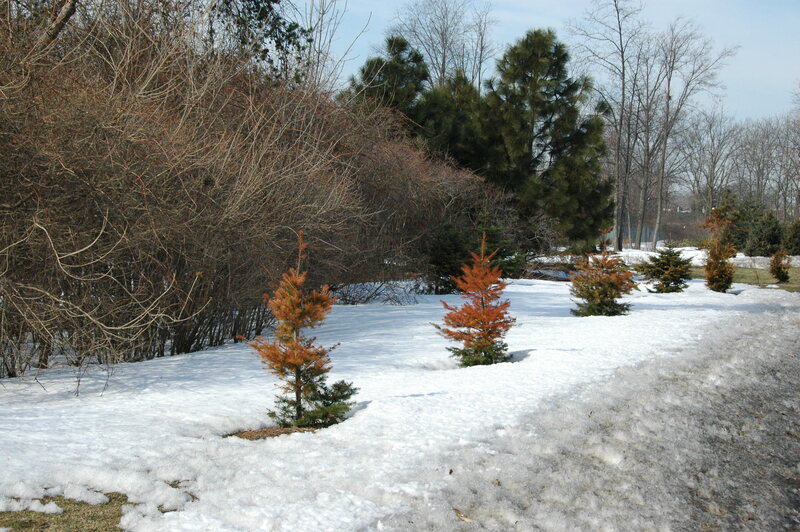 This varies among species, but most conifers need to accumulate at least 6 weeks of chilling below 40 deg. F to overcome dormancy. So early cold weather where the tree is grown and harvested is step one. Second, the “Zombie tree syndrome” is most likely to occur in species that are adapted to high elevations or northern latitudes. The usual suspects are concolor fir (Abies concolor) and corkbark fir (Abies lasiocarpa var. arizonica). These trees have evolved in areas with a short growing season, so there is a selective advantage to breaking bud rapidly when weather warms in the spring – or if brought into a toasty 70 degree living room. One of the most obvious impacts of this winter’s winter is rapidly becoming apparent in Michigan and other parts of the Midwest: winter burn on conifers. 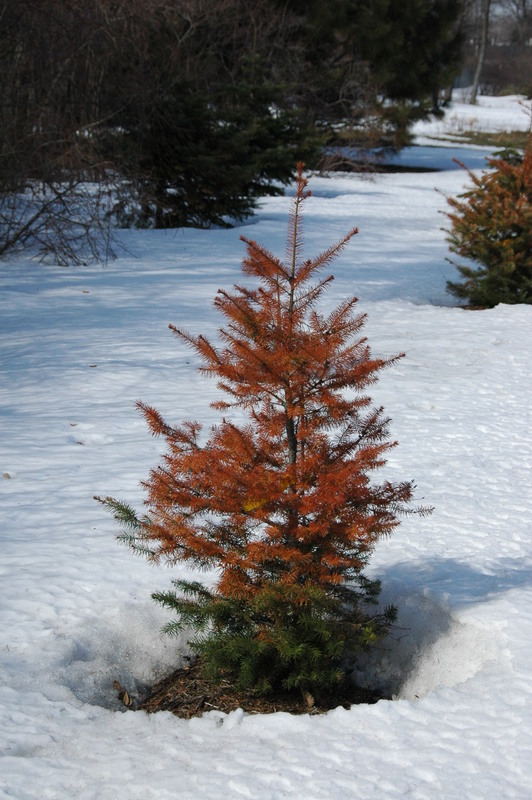 The primary symptom of winter burn is needle browning, especially on evergreen conifers in exposed locations. Needles may be damaged by extreme cold or the browning may be associated with winter desiccation as needles lose moisture during brief warm-ups. Winter burn is one of those situations that draws a lot of attention because it can look devastating; yet it often has relatively little long-term impact on plants. 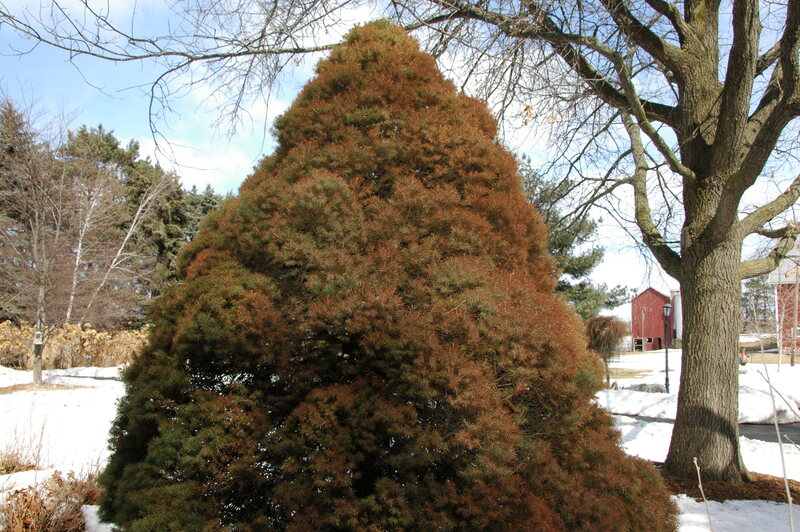 The key to the lasting effects of winter damage on evergreens is the extent to which buds are damaged. 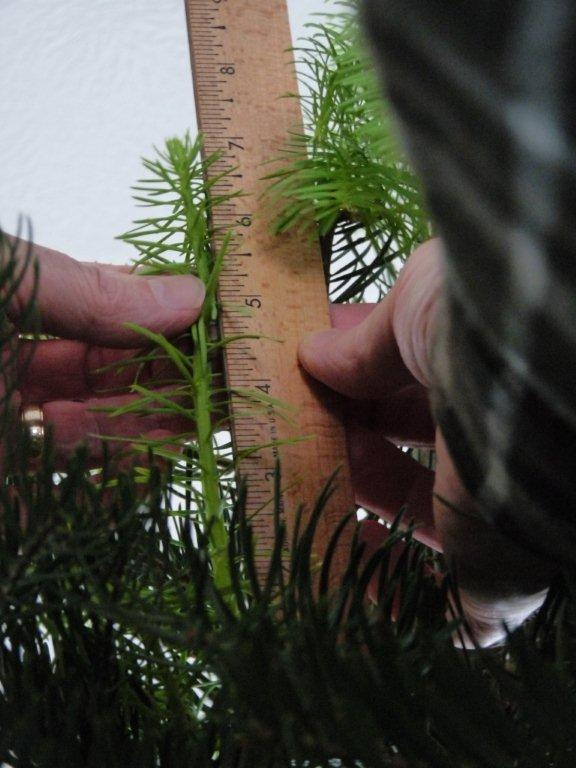 With a little practice it is relatively easy to determine the state of conifers buds. With your thumb and forefinger pull the bud scales from the top of the bud. 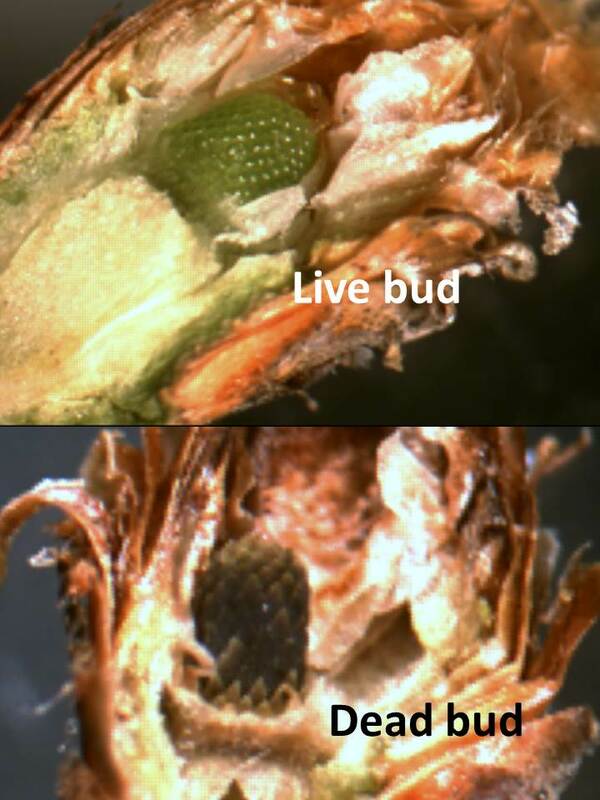 With a good hand lens or dissecting scope you will be able to see the bud primordia. On healthy buds this will be bright green; on damaged buds the primordia with be brown or black. Buds from conifers with severe needle browning may be alive (top) or dead (bottom). I recently examined buds from Douglas-fir trees on campus that had severe needle browning this winter. In several cases, trees had severe needle browning but the buds were fine. These trees will likely put on a normal growth flush this spring and in a year or two it may be difficult to tell they were ever damaged – assuming we don’t have a repeat of this winter’s severe weather. On some other trees, however, the buds had been killed by this winter extreme cold. This doesn’t mean these trees are dead – they may still form adventitious buds along the stems – but it will certainly set them back and will likely impact their form and symmetry. I just wrapped up putting together a species profile on grand fir (Abies grandis) for Great Lakes Christmas Tree Journal, which is the professional trade publication of the Michigan Christmas Tree Association. I do a lot of articles and presentations on conifers and while I draw on my personal experience and background as much as possible, invariably I’ll need to consult some references. 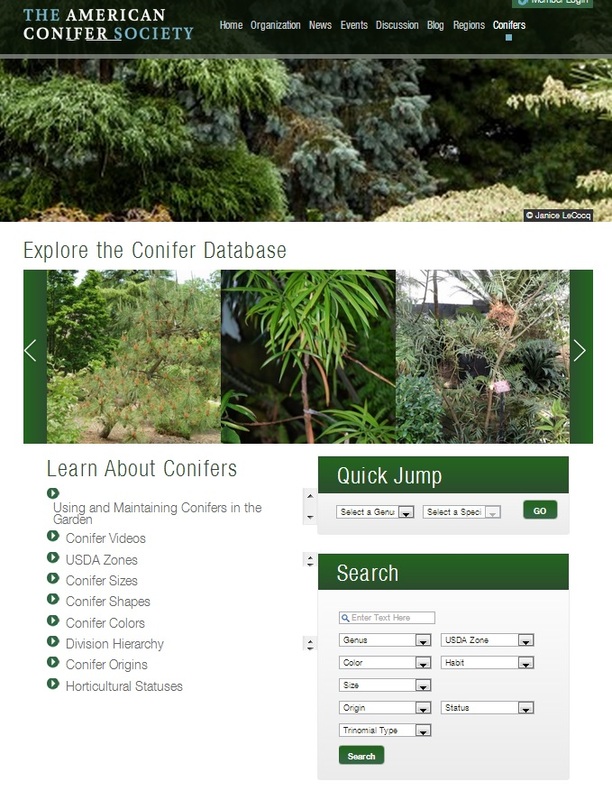 Here are some resources that may come in handy if you need to develop a presentation or article or just want to know more about conifers. Silvics is a forestry term that refers to the “study of the life history and characteristics of forest trees especially as they occur in stands and with particular reference to environmental influences.” Back in the day, just about every forester worth their salt had a weathered and dog-eared copy of Silvics of North America on the bookshelf. Today it is available on-line. Silvics contains lots of basic information about trees species; where they grow, how fast they grow, common best problems, and their genetics. Silvics also includes range maps from Dr. Elbert Little, which are a handy reference when you need to know whether or not a species in native in particular location. Chris Earle’s website is a botanical tour de force. It covers all gymnosperms, not just conifers but, of course, conifers make up the biggest portion of the site. 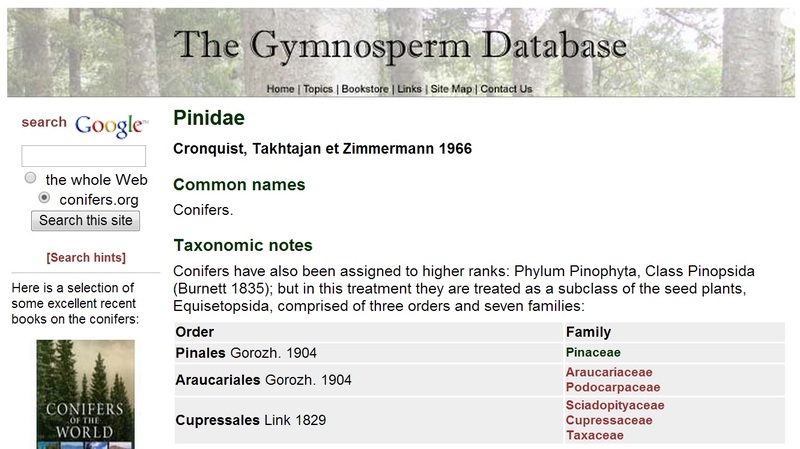 The Gymnosperm database includes species descriptions for essentially every conifer in the world. Many species descriptions also include images. Earle discusses taxonomy of conifers, which for many species, is taking more plot twists these days than an episode of ‘Law and Order’. There are often interesting tidbits under enthnobotany for many species. Bottom line, you can look up just about any conifer species you know on the database and learn something you didn’t know. The previous two resources deal primarily with conifers in their native environment. The ACS is dedicated to the Horticultural aspects of conifers. The ACS database includes hundreds of species and thousands of cultivars. 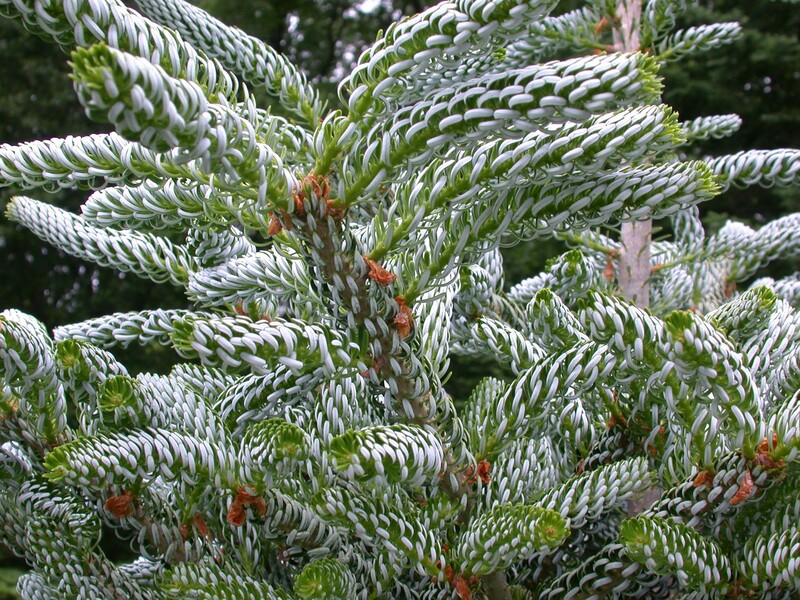 For Picea abies alone the database includes over 200 cultivars. For each cultivar the site presents information on hardiness zone, growth rate, form, color and other characteristics. Many descriptions also include photos. One of the things that comes along with having an extension appointment at a major university is I get lots of calls and e-mails from homeowners on a never-ending list of sometimes bizarre tree topics. Technically, my extension responsibilities are related dealing with professionals; such as arborists and nursery and Christmas tree growers, but the ‘consumer horticulture’ calls still find me. Last week I received a voice-mail message from an excited gentleman speaking at a decibel level somewhere between rock concert and jet plane take-off. From the disjointed and rambling message I could tell the gentleman was elderly and maybe disoriented or had just had a few. After identifying himself he indicated that he wanted to learn where he could find a “pine-nut tree”. Although he didn’t give it, I knew the man’s location from his area code. A legitimate response to such calls is to redirect them to the individual’s local extension office, but I hate getting the runaround as much as the next person, so I usually respond when it’s something I can help with and in this case I could. I dialed the number and the gentleman picked up right away. He sounded just as he did in the voice mail; gregarious, slightly rambling, and VERY LOUD. His story, however, made me glad I called back. His father had emigrated from Lebanon many years ago and he remembered how his dad had always reminisced about eating pine nuts in the Old Country. For years he had wanted to plant a “pine nut tree” in memory of his dad. The problem was every time he went to a nursery and asked for a “pine nut tree”, nobody knew what he was talking about. I explained to him that the pine nuts his father cherished were from stone pine (Pinus pinea) trees, which are the pine nuts (pignoles) favored for making pesto. In the US, the pine nuts that are sold commercially usually come from pinyon pine (Pinus edulis), which is native the southwestern US. Unfortunately, neither of those trees will grow in the Upper Midwest, where he lives. I pointed out that there are many other pine trees that produce edible nuts – the main reason those two species are widely used is because they produce very large nuts making them relatively easy to harvest. In fact, there are about 20 species of pine that produce seeds large enough that harvesting the nuts is worthwhile. Two pine species that produce edible nuts and grow well in our area are Korean pine (Pinus koraiensis) and Swiss stone pine (Pinus cembra). 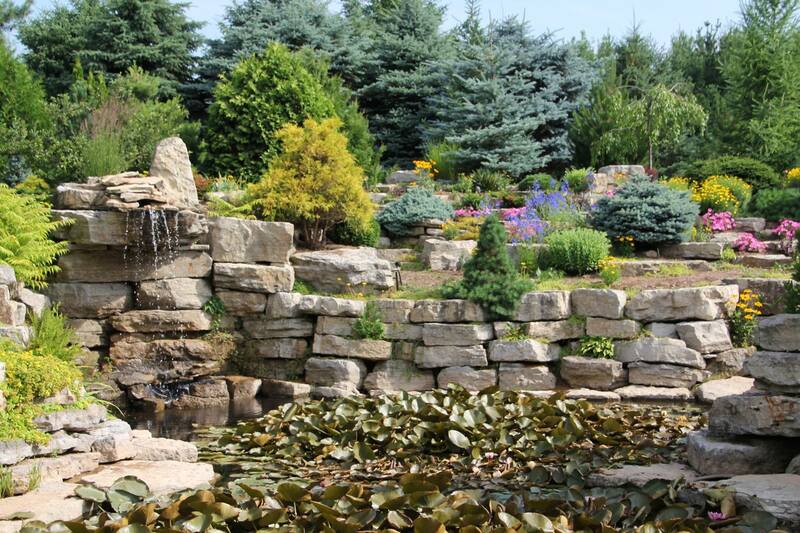 I include both in my recommendations for alternative conifers for Michigan. I gave the gentleman some information on nurseries in his area that I knew carried those trees and he was excited to have some direction on his quest to renew his father’s memory. Swiss stone pine (Pinus cembra) at Hidden Lake Gardens in southeaster Michigan. Sidenote: The heartbreak of ‘Pine mouth’. Have you ever experienced a bitter or metallic taste that persisted for days, even weeks, after eating pine nuts? Then you’ve likely experienced Pine Nut Syndrome or ‘Pine mouth’. The cause of the disorder is not completely known, but research by an industrious graduate student in the Netherlands suggests that nuts from certain pines; particularly an Asian pine, Pinus armandii, are most likely to cause the issue. So, if you are a pine nut fancier, learn what you can about your source. Pine nuts supplies can be cyclical since pine nut crops are often subject to biennial bearing. Soaring prices during poor supply years provide incentive for inferior nuts to work their way into the market. Posted on September 2, 2013 Author Bert CreggCategories UncategorizedTags conifers, edible7 Comments on R U nuts? The photo below (graciously sent to me by former MSU Extension Educator Jennie Stanger) graphically illustrates the importance of removing ALL staking and supporting materials from trees once they are established. In this case the stakes were removed but the strapping material was left around the tree. Since this is a spruce, Jennie supposes no one wanted the prickly job of wading into the center of the tree to take off the strap. Eventually the trunk was girdled and when the area recently experienced some heavy thunderstorms, the weak spot on the tree was exposed. As a general rule we recommend that all staking and support materials are removed within two years, preferably one year. This type of damage is one of the prime reasons: after two years who is likely to remember that there is still strapping left on the tree? The perk of participating in a blog is you get a platform to vent on your pet peeves. Recently I’ve seen several classic examples of ‘Carrot-top’ syndrome. No, I’m not talking about the red-headed comic; though he tends to annoy me too. The ‘Carrot-top’ I’m referring to occurs when white pine trees are sheared as Christmas trees but then planted as landscape trees. The typical result is that the side and lower branches remain suppressed while the terminals go crazy. I’m not sure why syndrome occurs in white pines and not other trees; it may be related to vigor of white pines and how hard the growers have to shear them to keep them in shape. I love my friends in the nursery and Christmas tree industries and they work hard to grow quality trees, but this is one practice I’d like to see end. And, to be fair, they are giving customers what they want. If we set up a survey at a garden center and placed a 7’ sheared white pine next to a 7’ white pine that had been minimally pruned, 19 out of 20 people would take the tree that had been sheared to look like a Christmas tree. However, this is truly a case where less is more. We finally got a reprieve from our wet, cold weather. Just in time for the annual inspection of the conifer troops at the Harper Collection of Dwarf and Unusual Conifers at MSU’s Hidden Lake Gardens. One of the interesting things about making repeated trips to a conifer collection like this is that different conifers stand out each time. Whether due to lighting, background foliage, your mood, whatever; it seems like there are different stars each time. Here are some of today’s standouts. ‘Chief Joseph’ lodgepole pine. Discovered in the wild near Joseph, Oregon where Chief Joseph, leader of the Nez Pierce once lived. 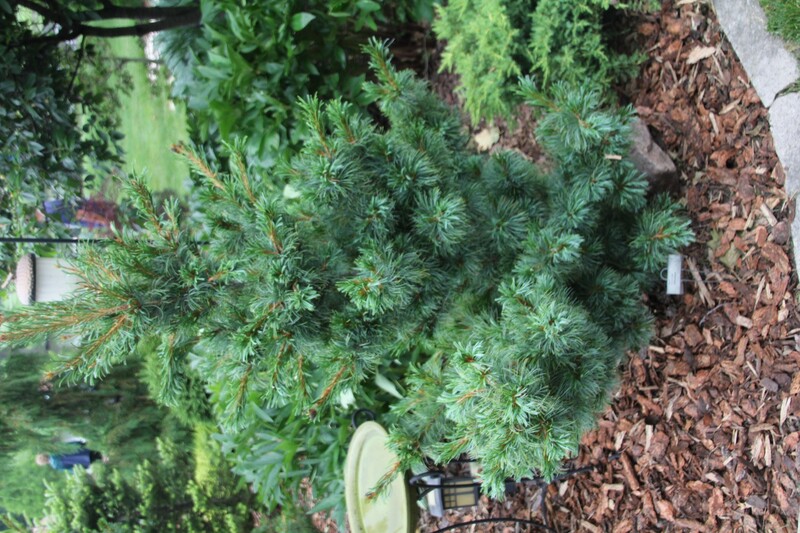 ‘Blue cloak’ concolor fir (white fir for people living on the West coast). 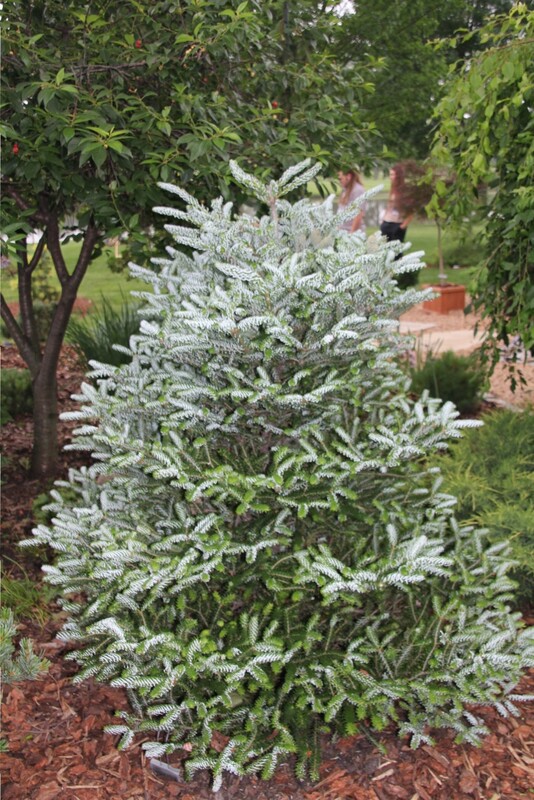 One of the most intense blue forms of color fir – rivals virtually any Colorado blue spruce. 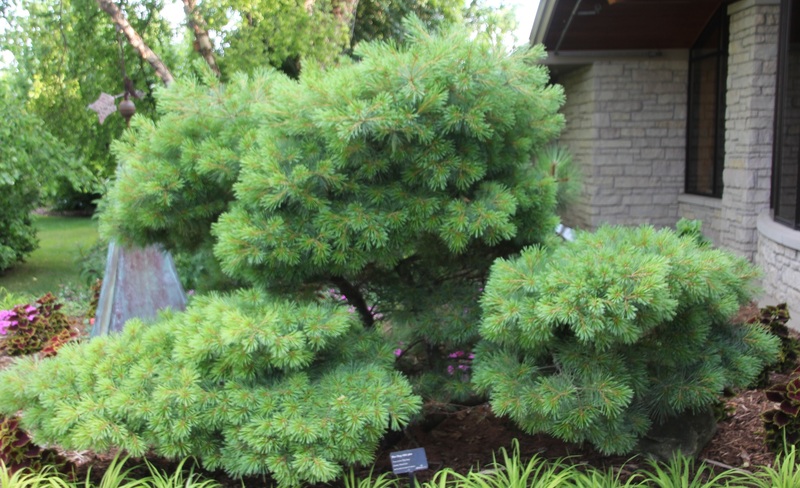 ‘Joe Kozy’ Japanese umbrella pine. Sciadopitys is one of the most primitive forms of conifers with fossils dating back over 230 million years. This cultivar was selected for its fastigiate growth by Sidney Waxman at the University of Connecticut. And, of course, they always look great when you put them together. 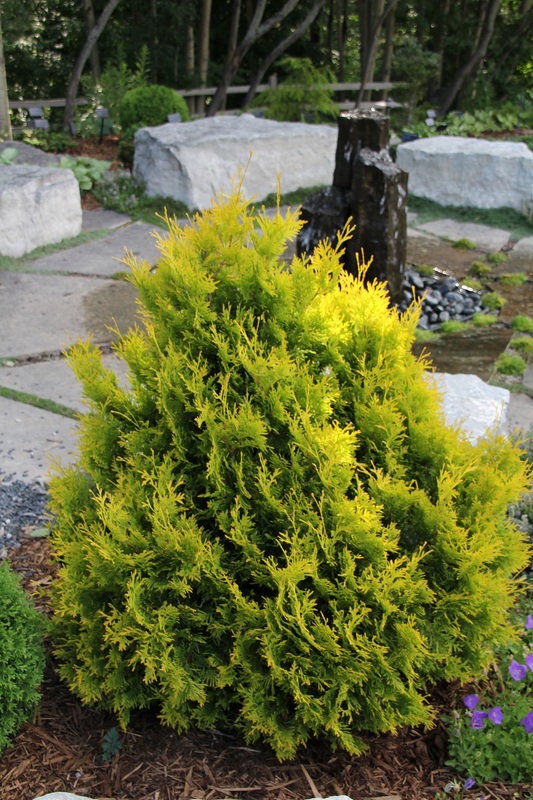 For more info on these and other conifers check out the American Conifer Society Conifer database. As a graduate student at the University of Georgia many years ago I took a course in research methods. One of the discussions that stuck in my mind all these years centered on the word ‘Serendipity’. The classic definition of the word is “the faculty or phenomenon of finding valuable or agreeable things not sought for.” As scientists we rely heavily on the scientific method as a systematic method of inquiry to make new discoveries. But we also need to need to keep our eyes and minds open to serendipitous discoveries along the way as well. So what got me thinking about serendipity? A few weeks back I visited a Christmas tree grower in northern Michigan with Jill O’Donnell our state-wide Christmas tree educator. The grower called us in because he had some questions about some unusual trees in one of his Fraser fir plantations. And, not only were the trees unusual, they were gorgeous. The only question was; what were they? The plantation originated from seed the grower had collected himself from some older Fraser fir trees he kept as a seed orchard. He sent the seed to a large forest nursery in the Northwest, which grew the seedlings and sent them back to him. The grower wondered if seed of another species could have been introduced in the process. Possible, I told him, but not very likely. Nurseries that are serious about contract growing are meticulous in keeping seed lots separate – few things are worse in that business than sending the wrong seedlings. Plus, I’ve worked with many species of fir and this was one I didn’t recognize. 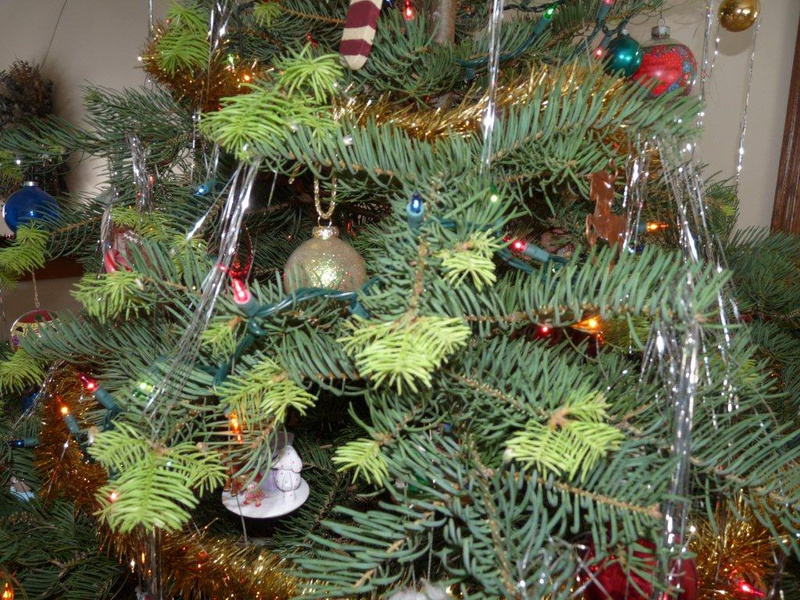 The trees had many characteristics of Fraser fir but also had attributes of concolor fir; long bluish needles and a slight hint of citrus scent when the needles were crushed. Many fir species can hybridize and all I could think was these trees had to be hybrids. “Are there any mature concolor firs near the seed orchard?” I asked. The grower brightened, “Actually there’s a group of older concolors about a half mile up the hill from the Fraser fir orchard.” We jumped in his pick-up and visited the concolor firs. Many of the trees had cone stalks indicating they were reproductively mature and could produce pollen. Conifer pollen can travel for miles so it’s reasonable to expect that some of the concolor pollen could reach the Fraser firs, which were downhill and downwind based on the prevailing winds in the area. So what’s next? There are several reasons to follow up on this serendipitous discovery and try to make some additional crosses. First, as evidenced by the photos, the trees look fantastic. Second, Fraser fir and concolor fir are each great trees but they also have some liabilities. A downside of concolor is that they break bud early and often suffer late frost damage – Fraser’s break bud late. 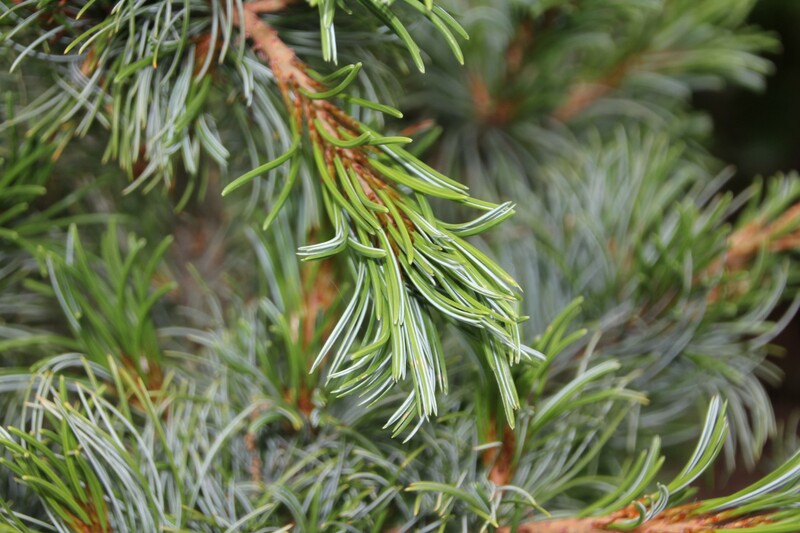 Fraser fir need acidic, well drained soils – concolor fir can grower on a broader range of sites. It’s possible that the hybrids will have intermediate characteristics that would make them ‘the best of both worlds’. The only thing left is to decide what to call the hybrids. Nurseries like to combine common names. So, Craser fir? Froncolor? The issue of potential damage to conifers by the turf herbicide Imprelis continues to get a lot of air play in this neck of the woods. One of the interesting things about watching an emerging story such as this is watching some of the sideshows that go on around it and how people spin the issue to match their needs and agenda. On July 14 I received an e-mail advertisement from Growth Products, Inc. breathlessly announcing “An Essential Cure For Trees Damaged By Imprelis Or Sahara Herbicides.” Pretty impressive stuff: We’ve only known about the issue for three weeks and these guys have already found the cure. I had to read on. The cure consists of an “Essential Cocktail” of three Growth Products liquids including Essential Plus (a rich concentration of organic ingredients including humic acid), Micrel Total (“Eight chelated minors to help the tree through stress”) and Companion (a biological fungicide). Alas, once again eye of newt and wing of bat were apparently out of stock. But, “The magic mix can be used as a soil drench and/or a soil injection.” The e-mail also included a link to an article I wrote for our extension news that included a photo of some maple trees that had largely recovered from herbicide injury by Sahara in 2009. I also documented the case here on the GP blog I wasn’t aware, but apparently a landscaper treated the trees with some of these concoctions. No word in the e-mail from Growth Products on how the untreated control trees did.